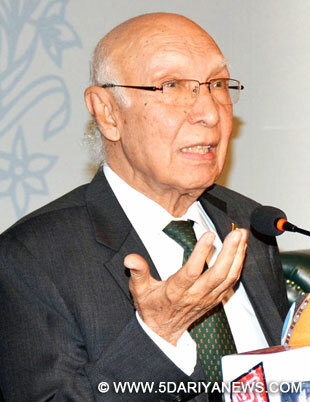 Reiterating that his country "is committed to lasting peace in Afghanistan and the region", Pakistan's de facto foreign policy chief Sartaj Aziz on Sunday said only one country cannot be blamed for rising terrorist violence in the region. "The first and foremost in our view is continuing violence and acts of terrorism claiming scores of human lives. This needs to be addressed urgently and effectively through collective efforts," Aziz said at the 6th ministerial 'Heart of Asia Conference - Istanbul Process on Afghanistan' in this Punjab city near India's border with Pakistan. "It's simplistic to blame only one country for the recent upsurge in violence. We need to have an objective and holistic view," Aziz said at the two-day conference. Earlier, Afghanistan President Ashraf Ghani, in his blunt remarks in the presence of Indian Prime Minister Narendra Modi, unequivocally named Pakistan for promoting terrorism in the region.Aziz said Pakistan had "been making serious efforts for facilitating peace talks between the Afghan government and Taliban that have not yet produced positive results". "We need to make an objective evaluation of our efforts for peace and stability in Afghanistan." Aziz said his government stood in solidarity with the elected government and people of Afghanistan in furthering the objective of peace, stability and development. "In our view, there is no military solution to the Afghan conflict and all our efforts should be to achieve a politically negotiated settlement through an Afghan-led Afghan-owned process. "Advocating the need to promote connectivity across the borders, the diplomat said Pakistan was committed to enhancing facilitation for transit of Afghan goods through Pakistan. "We believe the two sides need to work together for extension of and improvements in the Afghanistan-Pakistan Transit Trade Agreement. In this context, let me emphasize that peaceful resolution of outstanding disputes will further improve prospects of regional cooperation and connectivity."